We were in Orlando visiting my friend Doug and going to Disney World for a week or so. One afternoon Blake and I came in after a long day at the parks and Doug announced that Blake had received a package. We were all kind of incredulous (except Blake, it turns out) since who would possibly have a reason to send Blake a package while we were in Florida on vacation? The package wasn’t there — it was just a “Sorry we missed you!” slip and the address of the post office where we’d have to pick it up. At one point Doug asked, “Blake, were you expecting a package?” and Blake said something evasive which basically amounted to “no” except that I was absolutely certain from his response that he in fact was expecting the package. And I further knew that for him to receive a package here he’d have to have gotten Doug’s address which would have required asking me for my laptop or my cell phone. And since I hadn’t been asked, I knew that this was probably some sort of surprise for me. My birthday is right after Christmas, so although we would be home well before either occasion, I thought it was probably somehow connected to one of them. I did consider that it could be a ring, but it didn’t seem very likely and I didn’t give it a lot of thought. I knew Blake wasn’t going to date me forever without a proposal, though, since I’d heard him on several occasions talk about people who date for years and years and never marry and how he thinks that’s a big waste of time. So I thought he’d probably propose eventually, but it seemed so unreal that it could actually really tangibly happen. I speculated to Beth that maybe he was planning it for my birthday in January. Anyway, so there we were in Orlando with this “Sorry we missed you” slip for a package I couldn’t ask Blake about. He was obviously keeping it a secret from me and so I didn’t want to pry. So a day or so went by and nothing was said about the package although I dedicated quite a lot of thought to what it could be. Eventually Blake said, “Hey, can we get that package tomorrow?” So in the middle of the day we left the Magic Kingdom and drove to the Windermere post office, waited in line for fifteen minutes, and picked up the mysterious envelope. When we got in the car he put it right on the floor and I couldn’t see it at all, and I was super curious but didn’t say anything. Then when we got back to the condo he dropped it right in a laundry basket and put his coat on top of it, and off we went back to the park as though nothing strange had happened at all. 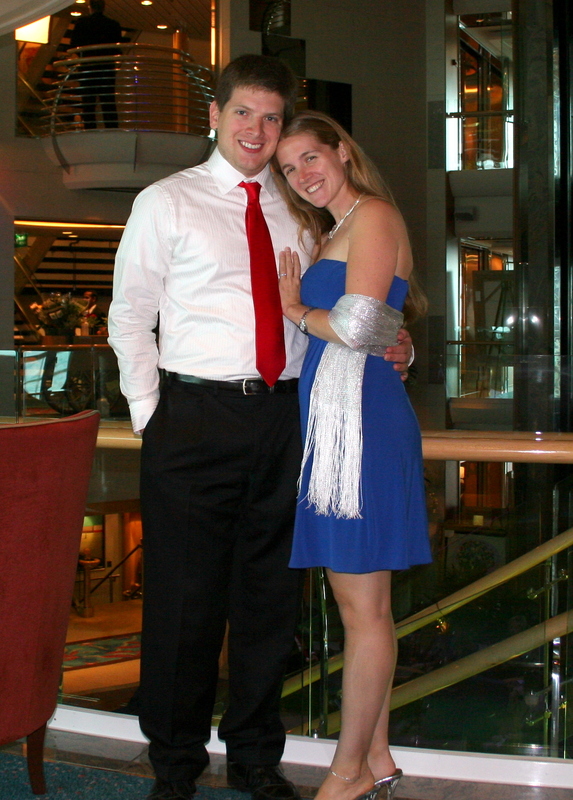 I had planned to ask Sarah to marry me for several months (really since March, when we last went to Disney World). My plan had been to ask her at Disney World, since that is pretty much the single place on Earth that makes Sarah the absolute happiest. So I had been dropping slight hints that maybe we should plan another trip to Disney in the future. She eventually got the Disney bug, and planned a trip for December. I somehow thought it would be in late December, so I spent some time thinking about what venue to propose in and what to do about a ring. I decided I would get a ring that I liked, and I knew Sarah would like it because I got it for her. I would tell her “if you don’t like it, or you want something else, we can exchange it, and you can get whatever you want for a wedding ring”. I have no taste in rings, so this worked great. I’ve always liked titanium rings and the symbolism of wearing an incredibly strong metal as a representation of marriage vows. So I decided to get Sarah a slim, thin, light, rounded titanium ring that matched (sort of) her favorite ring to wear on her right hand. Eventually I realized we were going to go in something like a week, very early in December, so since Sarah and I live together, I had to wait for a sneaky opportunity to order the ring. I ordered it while she was at a contra dance, and told them to ship immediately with no sizing guide. Sadly, it took too long to get to Austin, and we had to leave for Orlando first. On the way to Orlando, I picked up Sarah’s phone in the car once we started getting close to Doug’s condo, and asked her about Doug’s ridiculous street name (Maritime Flag Street), and then I looked at the apartment number when we walked in. I sent a text message to Tom and he said he would mail it. I knew I would almost certainly end up picking up the package with Sarah in Orlando, so gave Tom some special instructions. Tom went out of his way to get a girl in his lab to write the address on the package (my mom’s address) and “do not open until Christmas” so that Sarah wouldn’t know what the package was for. Then one day Doug walked into the condo and said “Blake… you got a package?” and gave me the Sorry We Missed You post office thing. Sarah and I went to the post office and picked up the package with no incidents. Later, she said she thought it was some kind of Christmas present for her. I gave her the ring, which luckily fit, and we stood up and kissed in the restaurant. Once we sat down, everyone behind us started clapping (apparently they noticed). Our waitress came back to top off our waters and Sarah held up her hand and said “We just got engaged!” the waitress obviously had no idea what to do, and went in the back and brought out two glasses of champagne. I took a sip and declared “I still don’t like champagne” and Sarah said, “me neither” so Doug and Jen drank our engagement champagne. So that’s what happened! It was all very exciting. We came home and called all our people and at first I could hardly remember what he’d said in the proposal because I was so excited. But then it all came back to me by phone call #3 and it’s been pretty exciting straight through from December 12 until now. Great engagement story, so happy for ya! !